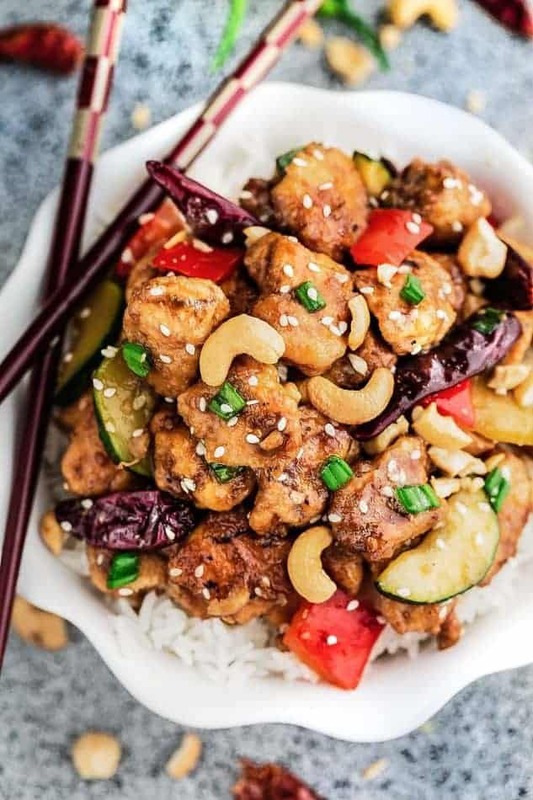 Kung Pao Chicken (Slow Cooker) – This delicious recipe is loaded with classic sweet & spicy flavours, your friends and family will think it’s takeout. Slow Cooker Kung Pao Chicken makes the perfect easy weeknight meal. Best of all, this popular takeout favorite is lightened up with the same classic sweet & spicy flavors as your local restaurant. In a large bowl or zip-top bag, combine the chicken, cornstarch, salt and black pepper. Shake until well-coated. Make the sauce In a medium bowl, whisk together all the ingredients for the sauce, set aside. Heat oil in a large skillet over medium-high heat. (You can skip this stove-top step if you prefer or are in a pinch. Just add chicken directly to slow cooker. Chicken will not have that crispy coating) Cook chicken about 2-3 minutes on each side, until lightly browned. Transfer chicken into the slow cooker and pour sauce over top. About 30 minutes before serving, whisk together the cornstarch and water in a small bowl and stir into the slow cooker. Toss in the dried red chili peppers, red bell peppers, zucchini and cashews, stirring to combine. Cover and cook on HIGH for another 20-30 minutes or until the vegetables are tender and the sauce has thickened up. Sprinkle with sesame seeds, green onions and serve over zoodles, cauliflower rice, quinoa or your favorite rice. Turn Instant Pot to SAUTE (skip this step and just cook on MANUAL for 5 minutes if you are in a pinch or prefer. The chicken won't have that crispy coating.) Allow pan to heat up for a few minutes then add oil. Cook chicken in batches (placing the browned chicken on a paper-towel lined plate) about 3-4 minutes on each side, until lightly browned. Once all the chicken is browned, add back to the Instant Pot and pour sauce over top. Close and seal Instant Pot. Click MANUAL and set for 3 minutes, let naturally release for 15-20 minutes. Transfer chicken to a large serving plate or bowl. Turn Instant Pot to SAUTE. Toss in the zucchini, bell peppers and dried red chili peppers. Cook for 2-3 minutes, until tender. Combine the corn starch with water and stir into the Instant Pot. Allow the sauce to bubble and thicken up. Return chicken back to the pot and cook for another 1-2 minutes until everything is heated through. Sprinkle with sesame seeds, green onions and serve over rice, quinoa or zoodles, if desired. Cook rice or your favorite side and divide evenly into lunch containers. Add cooked chicken and vegetables, cover and store in fridge for up to 4 days. ***If your slow cooker runs hot, be sure to check on chicken earlier as it may cook faster than the suggested cooking times.